We are offering a wide range of Plastic Injection Moulding Machinery for Textile Industry. Our offered machines are developed and designed keeping in view the industry laid standards. We are offering wide range of Plastic Injection Moulding Machinery for Textile Industry to the clients. Our offered machine is precisely designed and developed with using state-of-the-art technology to meet with industry laid standards. 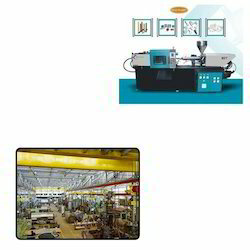 Looking for Plastic Injection Moulding Machinery for Textile Industry ?